The first Homeworld which came out in 1999 did not age that well, today it has extremely outdated graphics and is quite bothersome to get running on modern hardware. Homeworld 2 which came out in 2003 on the other hand aged a tad better. It still had its issues on modern hardware, but it was playable and enjoyable, as well as having an extensive modding community. But now 16 years after the first Homeworld, we finally have a HD Remaster with both updated graphics & audio as well as gameplay. 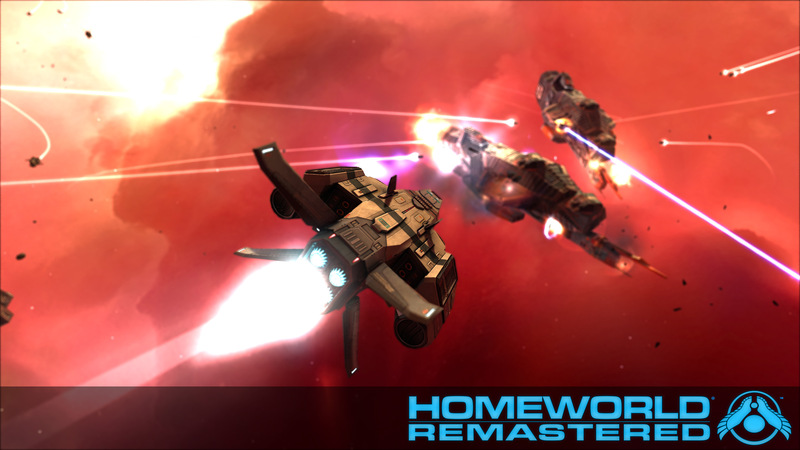 So what has been changed in Homeworld Remastered? Well, for starters there’s the visual overhaul which makes it look better than the older games, and in fact makes it look pretty freaking great by current standards. The Ui has gotten updated as well as revamped a bit so that it looks and handles better than the Ui from a game that’s from the turn of the century, as well as the fact that it can now actually scale properly with the screen resolution all the way up to 4K, whereas before if you were using dirty tricks/mods to get a higher screen resolution, the Ui would be pretty small on the screen since it lacked scaling. The audio and “cinematics” are updated and remastered. The big question is if this is something more than just a cash-grab, and so far it looks like it’s going to be a proper remaster that they have spent time and money on, around 1.3 Million $ on just buying the license to be precise. They actually have a couple of devs from the original team working on Homeworld Remastered. The same devs who were in fact working on sort of prequel that was “kinda” set in the Homeworld Universe ‘Hardware: Shipbreakers’ (now an official prequel with the name Homeworld: Shipbreakers) before Gearbox approached their studio ‘Blackbird Interactive‘ about the newly acquired Homeworld license. The Art director on the original Homeworld, Rob Cunningham, lead artist, Aaron Kambeitz, original audio composer Paul Ruskay and coder Luke Moloney are working on the Remastered edition. I played a lot of Homeworld 2 as a teenager, and I loved every second of it. I think I even have my retail disc in one of my “old games don’t throw out” boxes in the basement. However I could never get my friends into it so we could play multiplayer though, which should not be as much of an issue nowadays I hope. As for Homeworld 1, since it’s really awkward to get running on modern hardware, well I’ve actually never played it (shame on me), I’ve completed the Homeworld 2 campaign countless of times, but never the original Homeworld campaign. Now I’ll finally get the chance to actually play the first game’s campaign. All in all Homeworld Remastered is looking amazing so far, and I’m hoping that its money well spent, if not, well shame on me for being a sucker and pre-ordering. I’d love it if we got to see a Homeworld 3, as long as Gearbox did the smart thing and let the old team handle everything again, and not try to “modernize” it too much. Until then we will probably see a bunch of great mods come out though, since Homeworld 2 had such an enormous modding community for its time. For now I’ll leave you with this lovely video.